The violet flame is an invisible (to most) spiritual energy, also known as the seventh ray, that corresponds to the highest frequency of violet light. The Ascended Master St Germain was said to have brought, or revealed, this powerful ray of transmutation to the planet. The Violet Fire’s power is that of alchemy. More specifically, the transmutation of all negativity and resolving of all woundedness and conditioning. Upon arrival in Mount Shasta for the first time, Greg “Magick” Bernstein, encountered the Violet Flame when guided to a powerful sacred site on the mountain, He was ungulfed in its cleansing flames and blissfully released lifetimes of old trauma and hurt for almost an hour. For the next 10 days he woke everyday immersed in the potent purple light and basked in it for hours each morning in his bed before rising. The flame continued to work on/through him until a few years later he was guided to create this mediation CD which brings to Violet Fire to you. Imagine how different life would be if you had a simple and effective tool to clear wounds, traumas, conditioning and history that has limited you from reaching your highest potential. Go on a journey with the power of the violet flame to gently transmute negative energy, blocks and patterns that no longer serve parts of your being. Magick has created this CD specifically to clear any obstacles that are holding you from anything you desire! With this CD, you will be able to clear your chakras, organs and body systems. You will also be able to clear emotions and patterns that no longer serve you, such as fears, doubts, and stories. Further you can clear anything specific going on in your life that you bring to the meditation. 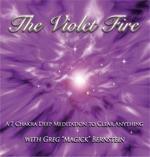 The power of this CD is based not only on the clearing power of the Violet Flame. It was also recorded at a sacred site with the intention to transmit the healing power. This offers a comprehensive and deeply transformative tool that you can use to clear anything, over and over again. Listening to this CD allows you to remain clear, connected to source and releases blockages to anything you desire. Do not operate heavy machinery or moving vehicles while viewing or listening to our products. The statements made within our products have not been evaluated by the Food and Drug Administration and are not intended to diagnose, treat, cure or prevent any disease.